5 Watts is Half the Loudness of 50?! You know the old amp wattage battle that occasionally will break out on the intrawebs. 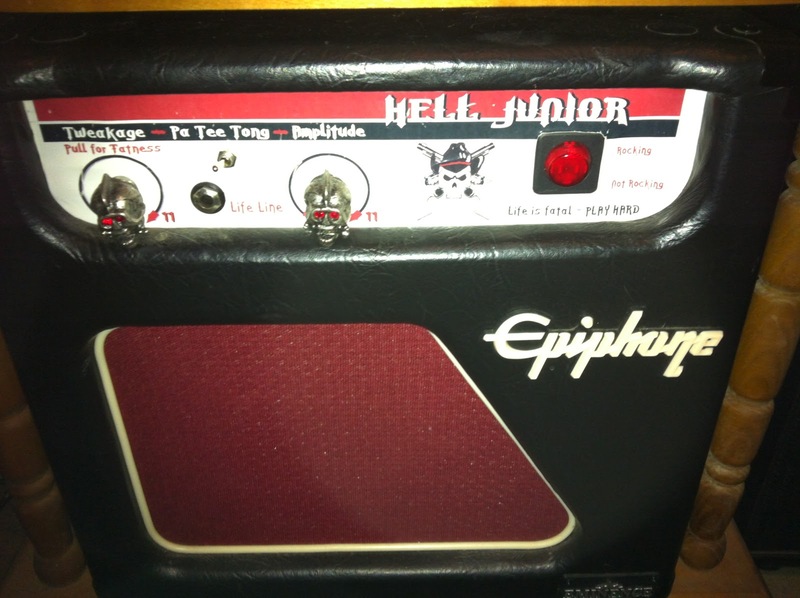 The concept is that a 100 watt amp should be twice as loud as a 50 watt amp. Another twist to this is that people will say a 5 watt amp is half as loud as a 50 watt amp. How can that be you ask? When I was trying to decide on my amp this became a real life question for me. 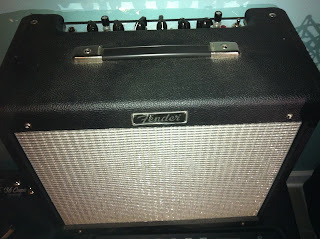 I wanted a Champ, but most Champ amps are 5 watts. An amp builder I was talking to kept telling me 5 watts was more than enough. On occasion I will do a gig so I wanted something I could love at home and play at a show. To me 5 watts just didn't seem like enough. My amp guy kept telling me I would not notice the difference between 5 watts and 12 watts. "It's all about headroom", he said. I decided it was time to do my own tests in my own labratory, aka my guitar room/office. I own a few amps. I have a highly tweaked 5 watt Valve Junior tube amp, now called the "Hell Junior" with an 8 inch speaker. 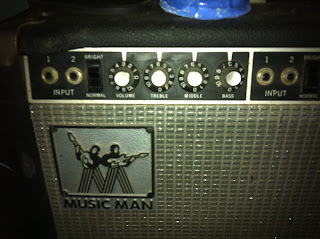 I also have a 130 watt MusicMan 2x12 HD tube amp (love that amp). It can do amazing cleans and I finally figured out how to get it to break up as well. 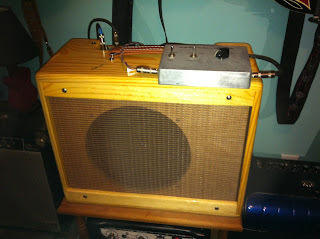 I have a 32 watt Kustom Coupe tube amp with a 12 inch speaker. I like this one but I might sell it to fund something else. I have a 100 watt solid state Mustang III with a 12 inch Celestian speaker. 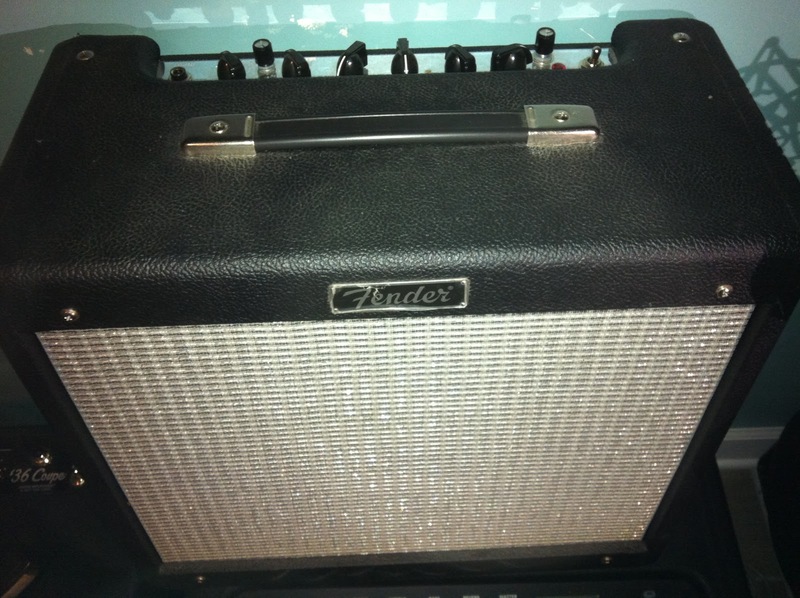 Finally I have a Fender Blues Jr. with a 12 inch speaker and 15 watts. The first question is how do I test the decibels of these things? I download a free app called Decibel by Skypaw for my iPhone. 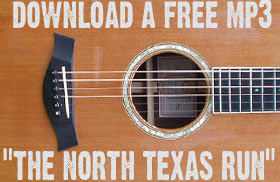 It was free and simple. I was a little concerned it might not be accurate but I decided even it it wasn't at least it would be accurately inaccurate between each amp and that data would be useful. Based off the numbers it seemed to be right on. I also had a set of ear plugs. I warmed up all the amps and then rolled all volumes and masters to 10. Some of them fedback at max volume but I wanted to see what they would really do. If I strummed a chord I would get a solid reading and then it might fluctuate up a db or so for just a second. I went with the decibel rating that seemed the most stable. The 5 watt Valve Junior amp was pretty damn loud. 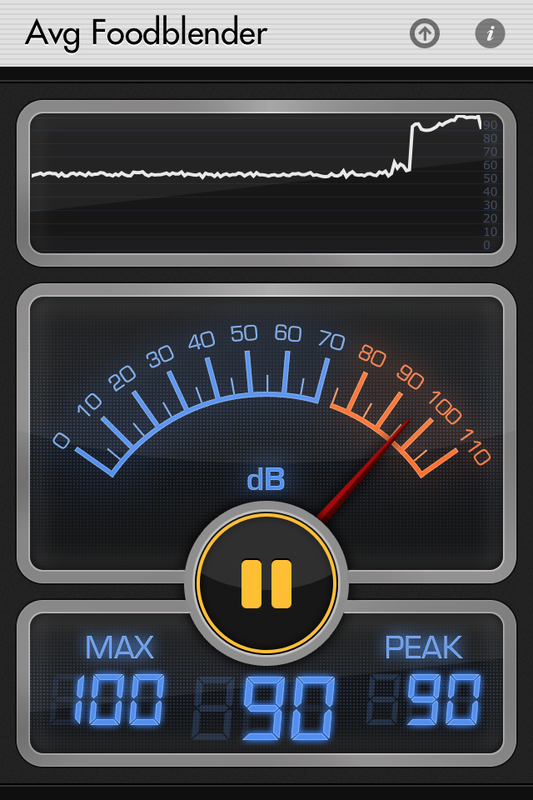 It came in around 95 decibels. The 8 inch speaker pushed no air. It also broke up earlier than a 12 inch would. I know that because after testing it with the 8 I plugged it into a 2x12. Neither seemed to push any air though. That comes into play later. 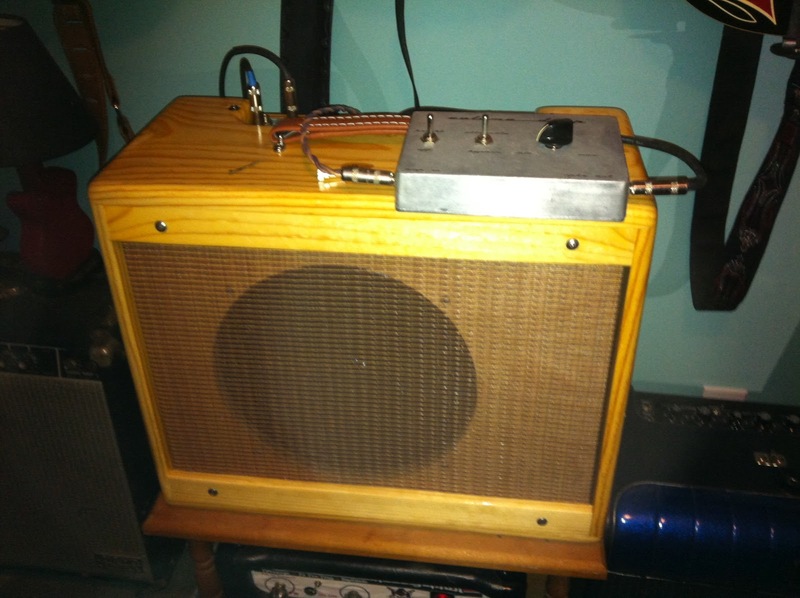 The 15 watt Blues Junior was slightly louder at around 98 decibels. I couldn't really feel much air being pushed by this one either. 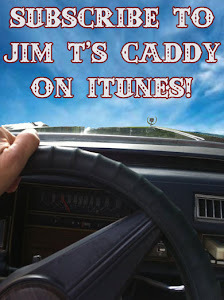 The 32 watt Kustom Coupe came in at a respectable 98 decibels! It pushed some air. 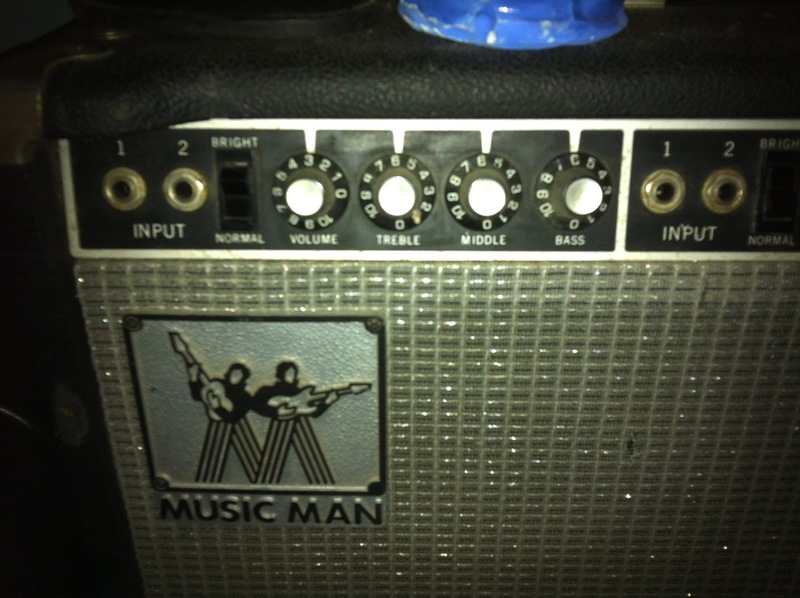 The 130 watt MusicMan did what it does best - GET LOUD. 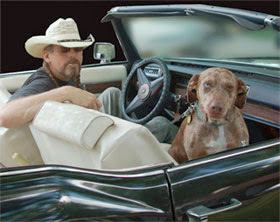 Prior to being married I lived in a house on Woodlawn Dr. in Nashville. I used to turn that amp as loud as it would go and shut all the doors and windows and sit on the porch and play it. I crap you negative when I say it literally shook the windows in their panes. That bad boy was pushing around 102 decibels. Now you wouldn't think there would be a big difference between 95 and 102 but holy hell was that a lot louder! The 2x12s were also really pushing the air and the bass. You could feel it in your body. This has a lot to do with "feeling" loud as well. 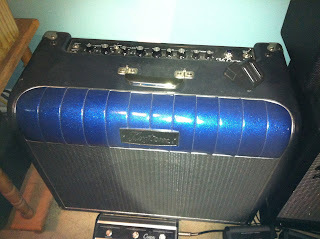 The surprise of the group was the solid state Fender Mustang III 100 watt modeling amp. I really do like this amp for all the things it can do. 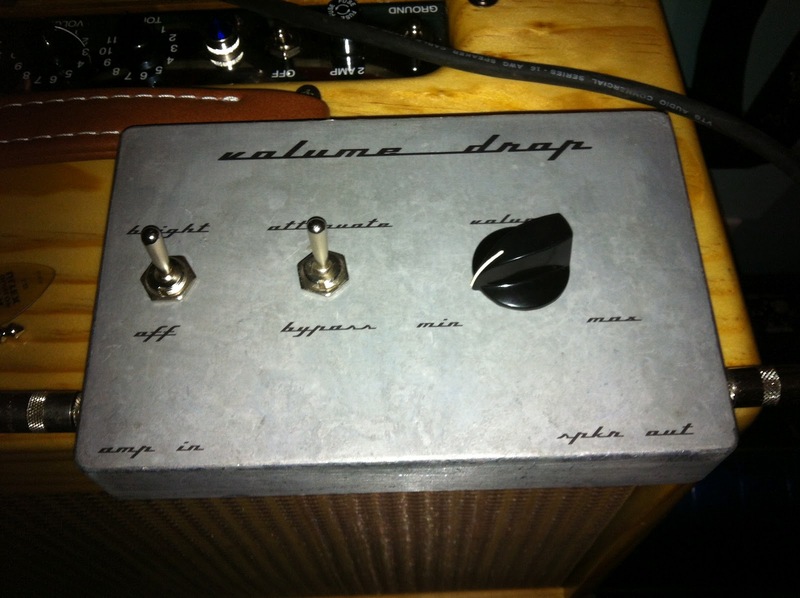 It has every effect in the world build in, not to mention all the classic amps. While it may not be the purest amp on the planet it gets close to sounding like some of the best. When I cranked this thing up it was LOUD and it sounded GREAT! To top it all off it really pushed a lot of air! 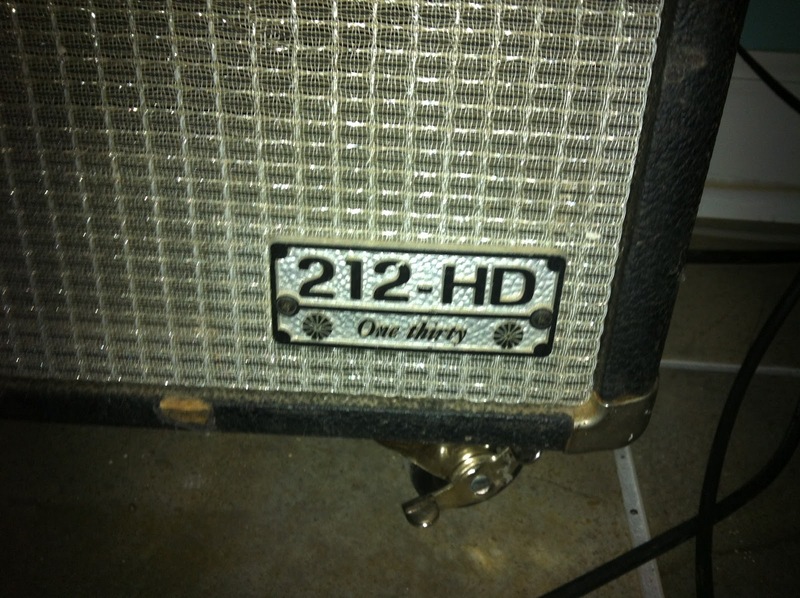 It was right there with the 120 2x12...almost. I was severely impressed! It came in at around 99 db. Based on all this I went with a the hand wired 5E3 Fender Deluxe Tweed clone at 15 watts with a 12 inch Jensen Lightening speaker. It pushes 100 decibels and seems plenty loud. The breakup on a 5E3 comes early with the right tubes and I'm fine with that. surprised me. It pumps right through your body. SIDE STORY - I was at a show in SC and I guess I cranked my MusicMan up during a song. The lead singer leaned back and yelled in my ear, "Your really burning it up!" and I yelled back, "THANKS!" and then he yelled back, "NO! YOUR TOO LOUD!!" Whoops. While the 5E3 is exactly the tone I was looking for to get it I had to crank it and if I kept going at that level I would go deaf. I jumped on ebay found a killer attenuator. An attenuator connects between your speaker and your amp. It's not a master volume. This one is super nice with a bypass and a bright switch. I tried it during my decibel test and the attenuator would crank up to full volume levels. It also allows you to get full tube grind at living room levels. If you like saturated amps you should own one!